The Breuil hotel is one of the iconic hotels in Cervinia and with its superb location right on the piste in the centre of the resort, it is always a popular choice. The hotel has a relaxed and pleasant ambience and offers great value for money. 40 All twins and singles have shower, TV, safe and telephone. The Hotel Breuil and facilities were lovely, staff were all amazing and the food was great, the Italian evening meals and wine were fabulous, far better than expected. The ski area was the most beautiful area I’d seen in the alps and being able to ski over into Zermatt was fantastic. 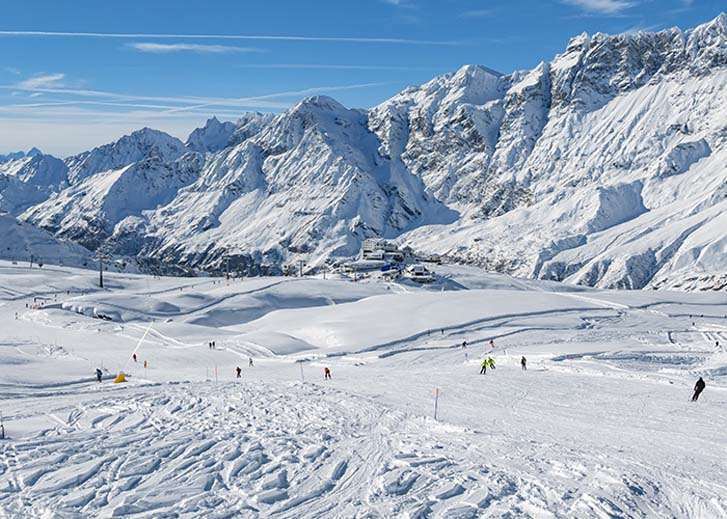 The Italian blues & red runs are quite soft, ideal for beginners the more experienced skiers would far enjoy the reds and black runs on the Swiss side. Our daughter was at Ride’em ski school, this was disappointing the instructors didn’t want to talk to us and progression was slow. Our crystal rep, although lovely was very nervous young and lacked knowledge of the resort, hotel and the holiday details. I feel she should have been supervised by a more experienced member of the team. Overall we all had a fantastic holiday a loved the area. Spent a great week in Cervinia in early April. The snow was definitely on its way out as the sun shone magnificently everyday. This made skiing a little difficult in the afternoons but still perfect in the mornings. The slopes were reasonably quiet and there were barely any queues for lifts. I attended beginners ski school every day and our instructor Gabrielle was very brilliant, funny and friendly and helped me to dramatically improve- going over a jump on our last day! Hotel Breuil was centrally placed and always welcoming. We had sky television in our room (including movies, which was great after a tiring day!) The room was cleaned everyday with fresh towels and an airing from our small balcony. The evening food was lovely, basic pasta and meat course but then an array of puddings! Cervinia itself was quaint resort with plenty of rental shops, restaurants and apres ski bars. However I would not recommend the resort for young people looking for a very active nightlife as it was more suited to families and quieter skiiers. Lots of pizzerias provided some amazing meals out! Overall was a great holiday, one which I would definitely do again!